Christians are the worst. So say the critics, many of whom come from within the Church. Everyone has a story of some Christian acting like a hypocrite, lying, committing adultery (or worse), or just plain being mean. The book UnChristian found that Christains (and Evangelicals in particular) have an image problem among nonChristians in America. Bradley Wright, a sociologist at UConn, says, “Not so fast my friend.” He believes that Christians don’t have an image problem so much as pollsters have a numbers problem. He doesn’t believe the polls, and doesn’t think you should either. The date, he claims, indicates that Christianity (and Evangelicalism in particular) is alive and well in this country. To prove his point about the numbers game, Wright comments on a recent, shocking poll that claimed the only group of people who were viewed more unfavorably than Evangelicals were prostitutes. The truth, however, requires a closer look at the numbers. A disproportionately large number of people responded “Don’t Know” when asked if they had a favorable opinion of Evangelicals—more than twice the number of the next highest group. Maybe a lot of folks don’t know what an Evangelical is. The poll also asked people their opinions of Born-Again Christians. Maybe others didn’t know the difference between Evangelicals and Born-Agains. The point is, according to Wright, you can’t always trust a poll, nor can you always trust the pollster’s conclusions. These are frightening statistics! And they’re also demonstrably false. Almost 76% of Americans self-identify as Christian, and 26% say they’re Evangelical. While 16% claim the title Unaffiliated, only 4% of our population are agnostic or atheist. (35) Not quite the death-knell of Christianity, is it? Evangelicalism isn’t shrinking either, having held steady at 26% of the population for 30 years. While the number of religiously unaffiliated people has grown in recent years (largely from the exodus of political liberals from mainline denominations), a majority of those believe in God, believe the Bible is the Word of God, pray regularly, and consider themselves to be religious and/or spiritual. The truth is that atheism is not taking over America. Despite the fears of many Christians, atheism has not grown in the past 20 years, and atheists constitute less than 2% of the total population. 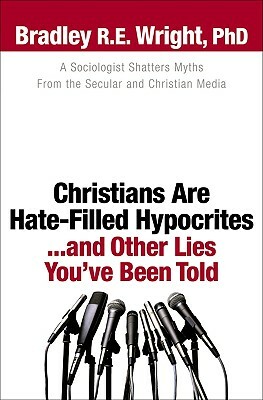 This is a very readable book that will help to dispel some of the myths about Christians and Christianity in America. Things are not nearly as bad as they seem. And if you read UnChristian (like I did), and thought that things were hopeless for Christians (like I was), then this book will be a great encouragement to you. Cheer up, Christian. You’re not really the worst!